Is Your Favorite Yogurt Really Healthy? It’s probably not that big of a news scoop that there are a zillion varieties of yogurt to choose from. But you may be surprised to learn that 4-in-5 brands make misleading label claims. Does your favorite yogurt promise you the world, but fail to deliver because they mix in junk ingredients that can do more harm than good? Put your favorite yogurt to the test with the Healthy Yogurt Challenge. There are 10 BestBrands Guidelines that separate the really healthy yogurts from the imposters. Before we give you the 411 on how to choose a healthy yogurt, we want to test your knowledge. Below are two brands of yogurt. From the front label they appear almost identical. However, the ingredients list will give you all the clues you need to distinguish the healthy variety from the imposter. Let the games begin. INGREDIENTS: Cultured grade A lowfat milk, blueberries, sugar, fructose syrup, high fructose corn syrup, contains less than 1% of modified corn starch, pectin, kosher gelatin, sodium phosphate, malic acid, natural flavor, calcium phosphate. Contains active yogurt cultures including L. acidophilus. The Stonyfield variety is made with all organic ingredients. It contains no junk ingredients and has SIX live active cultures. 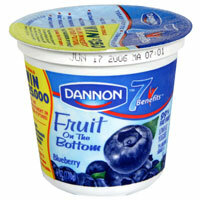 The Dannon variety has one of our least-favorite chemical additives – high fructose corn syrup. It also contains three fillers (modified corn starch, kosher gelatin, and malic acid), and one preservative and one thickener (sodium phosphate and calcium phosphate). It contains three live and active cultures. 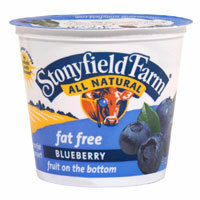 You guessed it…StonyField is the big winner. The moral of our challenge: Don’t judge a yogurt by its label. To ensure that you make the healthiest yogurt choice, quick-scan the front label and then focus on the ingredients list. 1. Look for a short ingredients list. 2. Stick with low-fat or nonfat varieties – you save fat and calories without sacrificing taste. 3. Make sure the words “Live and Active Cultures” are printed on the container – and the more the better. 4. Avoid labels that say “heat treated after culturing” – this kills the active cultures. 6. Avoid highly processed sweeteners like high fructose corn syrup. 7. Avoid preservatives like sodium citrate, potassium sorbate, and tricalcium phosphate. 8. Avoid cheap fillers like modified corn starch and kosher gelatin. Inulin – a natural dietary fiber. Organic milk – you’ll take in fewer antibiotics and pesticides than non-organic milk. Note: Plain yogurt varieties are your best bet. You’ll get more calcium and more protein, and take in less calories than the flavored varieties. However, if sweetened yogurt is preferred, look for varieties that have fruit on the bottom and are made with only all-natural sugar.